Greetings from Colorado! I woke up to a beautiful, sunny, 38 degree morning. Have a mentioned how much I love it here? The last week has been busy. Today is a lazy morning that I can sit back and just drink in the Word. I was reading in Luke 7 this morning and came across the account of Jesus raising a young man from the dead. Luke 7:11-17 Not long after that, Jesus went to the village Nain. His disciples were with him, along with quite a large crowd. 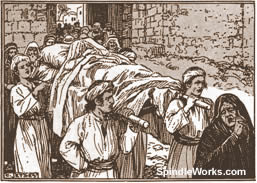 As they approached the village gate, they met a funeral procession—a woman’s only son was being carried out for burial. And the mother was a widow. When Jesus saw her, his heart broke. He said to her, “Don’t cry.” Then he went over and touched the coffin. The pallbearers stopped. He said, “Young man, I tell you: Get up.” The dead son sat up and began talking. Jesus presented him to his mother. They all realized they were in a place of holy mystery, that God was at work among them. They were quietly worshipful—and then noisily grateful, calling out among themselves, “God is back, looking to the needs of his people!” The news of Jesus spread all through the country. This is such a rich passage and tells us so many things about Jesus. On a side note - I think it is so important that we read the gospels over and over again (Matthew, Mark, Luke and John). We need to keep our picture of Jesus accurate and fresh all the time. Yes, these passages are familiar, but there is newness in them as the Holy Spirit continually teaches us and deepens our understanding and love for the Savior. *Jesus took notice - Even in his own busyness and in his own crowd, He took the time to notice this funeral procession and to pay attention to it in a detailed way. He then went out of His way to enter into the woman's pain. *Jesus felt compassion for her. At a time when women went fairly unnoticed and overlooked, Jesus' heart broke for this woman. Radical. *Jesus touched the coffin. WHAT? Let's just say that flew in the face of all kinds of legalism. I wouldn't be surprised if someone in the crowd fainted just to see such a sight. You just didn't do that! But Jesus wasn't just anybody. Nothing is beyond His touch. It is no surprise that the pall bearers came to a halt. I'm sure they were stunned. *Jesus spoke to the dead man . . . inside the wrappings . . . the man that was dead . . . No one is too far away or too far gone for Jesus' words to reach them. Don't you know that people were looking at Him with completely puzzled looks on their faces? *Jesus' words spoke life into this man. WOW Jesus' words spoke LIFE into this dead man. This same Jesus who spoke creation into existence spoke life into a dead man. He is powerful. Is anything too difficult for Him? *He gave this son back to his mother. She was a widow and would have been left with no means of support. She would have fallen on hard times and been at the mercy of others. Jesus really gave her back her life as well. I think that Jesus always delighted in the unexpected. He delighted in turning what had become a very complicated and convoluted religious and social order upside down. He delighted in restoring a son to a mother - in bringing what was dead back to life. It was indeed a holy mystery. He still delights in these same things. Do you feel like no one notices your pain? Jesus does. Do you need someone to come beside you in your hurt and despair? Jesus' heart breaks along with yours. Do you need the touch of Jesus on something dead in your life? Jesus is willing. Do you feel so far away from Jesus that you can not hear him? There is no distance too far - no pit too deep. His words will reach you. His words bring life. Do you need words of life spoken over the deadness that you feel? Jesus' words have that power. Nothing is too difficult for Him. Is there something that has been dead or dying in your life? Maybe it is your own joy. Maybe it is a relationship that seems to be dead and gone. Maybe it is a need that is so deep it seems unreachable. Perhaps it is a burden that you can no longer bear. Perhaps the nails have been driven into the coffin and you have lost all hope. Do not despair. Jesus in in the business of bringing dead things back to life. He delights in doing the unexpected. He knows. He sees, He acts. Beloved, you can count on Him.